​The work Diego Simeone has done at Atletico Madrid since arriving at the club in December 2011 shouldn't be overlooked, especially while in the looming shadow of both Real Madrid and Barcelona. The polarising Argentinian native has won a La Liga title, Copa del Rey title, two Europa League titles, as well as reaching two Champions League finals, all whilst playing with a certain pragmatism that we've come to expect from Simeone. While that style has served him well up until now, the squad that Simeone now has at his disposal perhaps lends itself to a more expansive brand of football; not revolution, but evolution. After re-signing Diego Costa in January of this year, before adding some much needed pace on the flanks in the shape of Thomas Lemar and Gelson Martins, there's still a sense of reluctance to go out and attack team. Simeone's mindset has still been reactive rather than proactive. ​Atletico Madrid have scored a measly 13 goals in 11 ​La Liga games this season, which is bettered by seven sides. 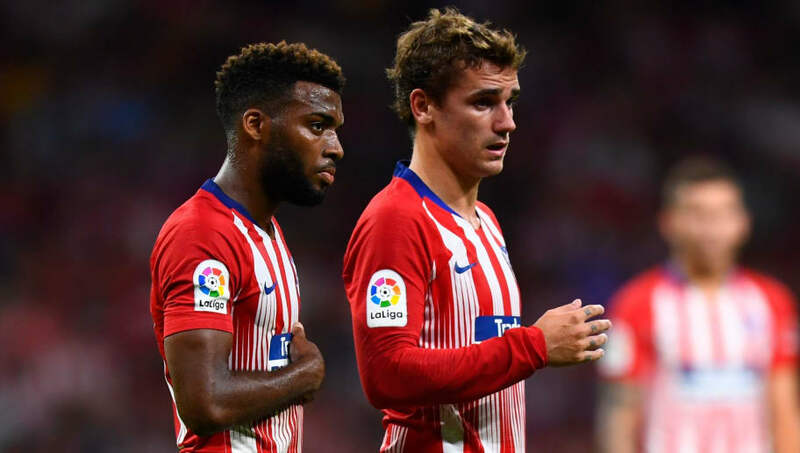 Antoine Griezmann is currently the club's top scorer in the league with just three goals, while Thomas Lemar, Angel Correa, Koke and Filipe Luis are all joint-second with two each. Diego Costa and Gelson Martins have failed to score in 12 league appearances between them, with the latter featuring only four times in La Liga, as Simeone continues to favour a 4-4-2 formation, with Koke providing industry down one flank. It must be said that Los Rojiblancos are only four points off Barcelona at the top of La Liga, however a recent 4-0 drubbing at the hands of Borussia Dortmund in the Champions League has led to many wondering whether it's time for Simeone to be more tactically flexible and expansive. Lucien Favre's side have been exceptional this season, and their attacking display against an Atletico Madrid team that prides themselves on clean sheets and a resolute defence made the rest of Europe sit up and take notice. A performance that was laced with pace, fluidity and speed in the transition from the Bundesliga side, it's certainly not out the realms of possibility for Atletico Madrid to do likewise. With a front three of Martins, Griezmann and Lemar, as well as the options of Costa and Correa off the bench, it's seemingly the right way to go; especially considering the fact that a midfield three of Koke, Rodri and Saul Niguez is certainly energetic enough to compensate for any gaps defensively that a more attacking mindset could present. Speaking ahead of their upcoming Group A game against Dortmund at the Wanda Metropolitano, ​Simeone has defended the very philosophy that has made him one of the most revered managers in world football, although a similar result to that at the Signal Iduna Park could make him rethink his ideals.